In Morocco they serve bread with every meal. 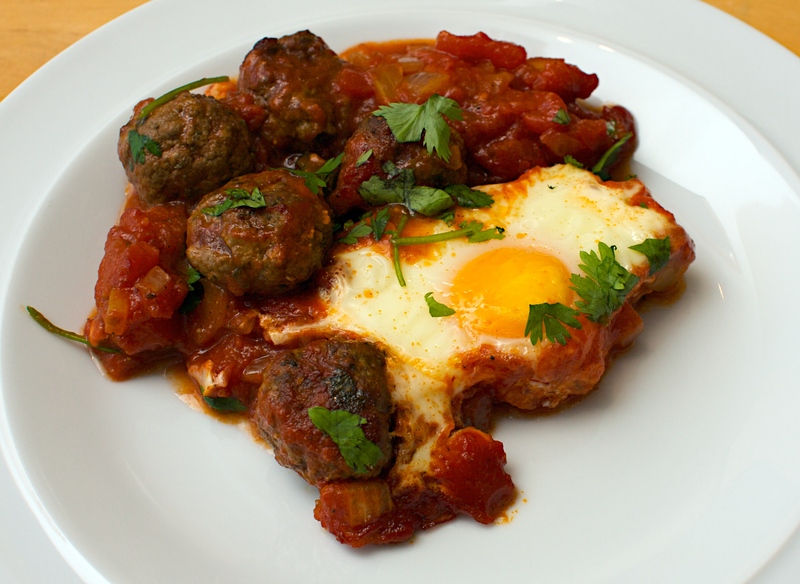 If you want eat this Moroccan-style, put the dish in the middle of the table and use flat-breads to mop up the little meatballs and eggs. It’s really worthwhile seeking out hot paprika (the paprika available in supermarkets is the sweet version), but don’t be tempted to use smoked paprika as it has a much stronger flavour and will overpower the dish. You can use minced lamb instead of beef if you prefer. The tagine also works well without the eggs, but they do add an extra layer of flavour and texture. Mix the mince with the parsley, 1 tsp of the cumin and ½ tsp of the paprika, some black pepper and about 1 tsp salt. Wet your hands and make lots of tiny meatballs (about the size of cherry tomatoes). Heat a couple of good glugs of olive oil in a frying pan and brown the meatballs in batches. Remove them with a slotted spoon. Add the onion to the pan with a little extra oil if necessary and cook gently until very soft (about 10 minutes). Add the tomatoes, the rest of the cumin and paprika, 1tsp ground black pepper and the garlic. Simmer gently for about 20 minutes but be careful that it doesn’t reduce down too much and become thick. Season well. Add the meatballs to the tomato sauce and pour into a shallow ovenproof dish. Push the back of a ladle into the mixture to make 4 wells to crack the eggs into. Bake for about 15 minutes or until the eggs are just set. Serve with the coriander and some warm flatbreads. Drink with: a fruity red. We had a glass of our favourite “everyday” wine of the moment which the the Selvapiana Chianti Rufina and it worked a treat. 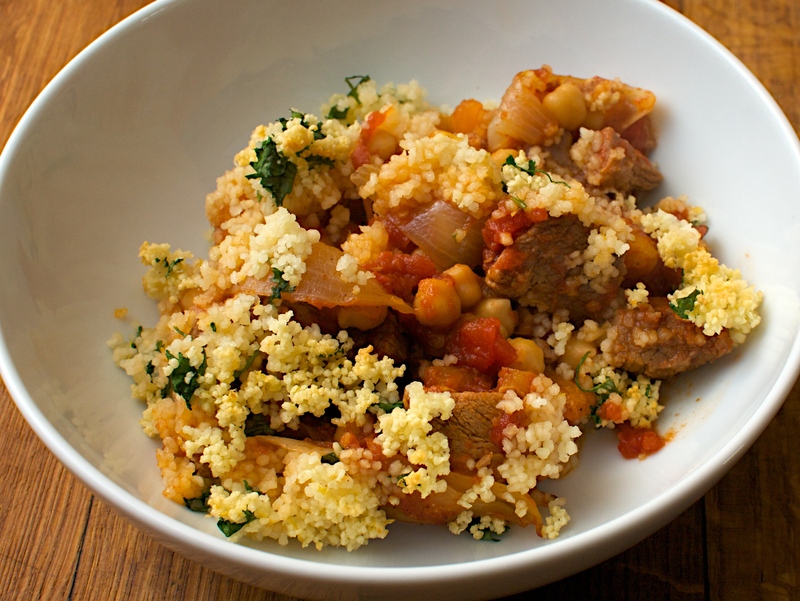 This is a much lighter version of a lamb tagine. We definitely prefer the full-fat version but this is super simple to make, tasty, and healthy – so if you’re watching your waste we highly recommend it. Heat the oven to 170C. Put the lamb, onion, garlic, spices, apricots, lemon, honey, chickpeas into a large ovenproof casserole with a lid. Season, then add the tomatoes and 400ml water. Bring to the boil cover and cook in the oven for 1½ hours, or until the lamb is tender. Turn the oven up to 200C. Add 150ml of boiling water to the couscous and leaf to stand for 2 minutes. Fork through to avoid any clumps and spoon over the lamb. Return to the oven and cook without the lid for about 15 minutes, or until lightly browned. Serve with some chopped coriander. Wine Suggestion: Mediterranean reds tend to complement spicy, sweet flavours. We had a really interesting Italian red from Etna called Tenuta delle Terre Nere, which was very elegant and not too heavy. We would suggest a lighter red such as a Carrignan/Granache blend which can be found on the Mediterranean rim such as France, Spain or Sardinia. If you can find one with a bit of age it should have mellowed out nicely.